“Never before has it been more urgent, or more possible, to end the practice of female genital mutilation (FGM/C), preventing immeasurable human suffering and boosting the power of women and girls to have a positive impact on our world,” said Former UN Secretary-General Ban Ki-moon. Every year, three million girls are at risk of undergoing female genital mutilation. The majority of girls are cut around the time of their fifteenth birthday, just before puberty or during adolescence. Female genital mutilation and/or cutting (FGM/C) is a traditional practice that involves the removal of part or the whole of the external female genitalia. In many cultures, it symbolizes the transition from girlhood to womanhood. Girls are often told that, in order to be married and to become a “real woman,” they must undergo FGM/C. 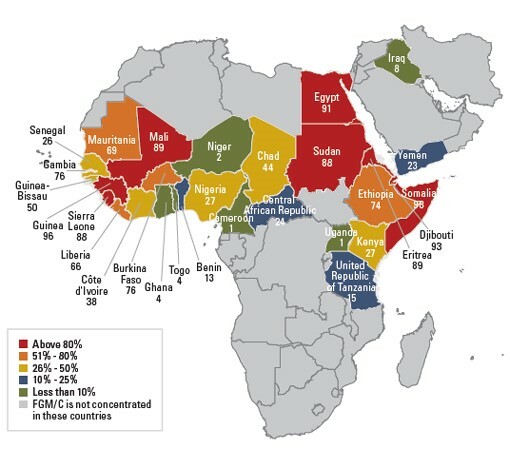 FGM/C has been documented in 30 countries, many in Africa, as well as in the Middle East and Asia (see below). The practice serves no medical purpose, but has deep roots in tradition. Percentage of girls and women aged 15 to 49 years who have undergone FGM, by country (Unicef, 2013). Sadly, the procedure has devastating physical effects on girls, including recurring infections that can affect the bladder and kidneys, chronic pelvic and back pain, incontinence, and obstetrical complications. Psychologically, FGM/C can be equally as damaging. Younger girls may show signs of traumatic stress, depression, and feelings of betrayal. The severe psychological trauma that women experience as a result of FGM/C can stay with them for the rest of their lives. Girls who undergo FGM/C are at risk of dropping out of school, which compounds the trauma of “the cut” by isolating them from friends, teachers, and mentors. The pressures to quickly marry and give birth along with the responsibilities of being a wife and a mother, prevent girls from ever completing their education. In Kenya, 27 percent of girls and women ages 15 to 49 have experienced FGM/C. Although both FGM/C and early marriage are illegal in Kenya, they persist. In rural areas, informal justice structures frequently carry more weight than formal legal structures, meaning tribal and community leaders often are responsible for determining whether or not the practice is stopped. We know that God created his children to experience life in all its fullness. In response to this violation of girls’ rights, World Vision is equipping government agencies, faith leaders, parents, service providers, local leaders, and community members to protect children from violence, including FGM/C. The Kenya Child Protection Project builds on World Vision’s established footprint in the country, empowering families and communities to give children opportunities to thrive. Act now to support this project! 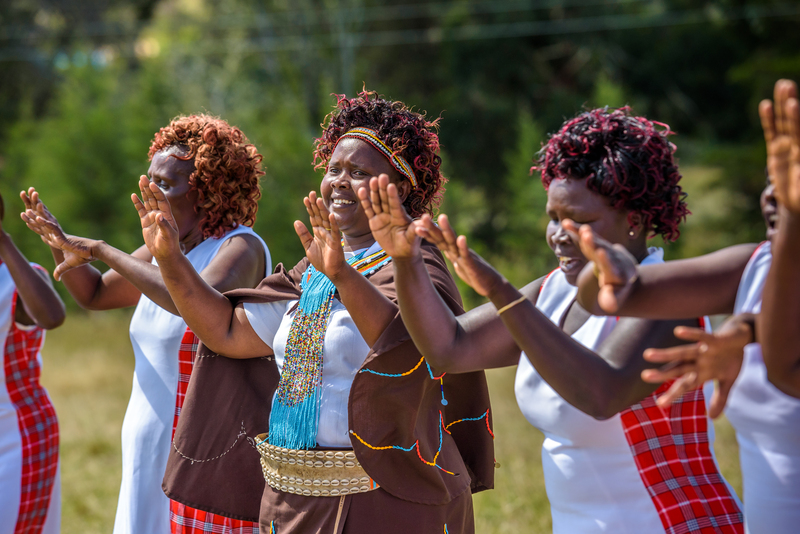 Our project educates tribal leaders and Area Advisory Councils (AACs) — the Government of Kenya’s local-level child protection governance body — on FGM/C laws and encourages these groups to enforce the laws for the sake of their daughters’ health and well-being. World Vision also builds relationships between local leaders and the police and judiciary, so that they can partner together in keeping girls safe. Our project prioritizes education as an alternative to early marriage by creating safe school environments for girls. Teacher training increases the quality of education and scholarships allow survivors of abuse and former child brides to attend school. Our work on this issue also provides an opportunity for girls to celebrate Alternative Rites of Passage during the December school break, a customary time for girls to undergo FGM/C in Kenya. After attending our one-week Alternative Rite of Passage training, Lucy (16), the daughter of a chief in the community, was inspired to advocate for the end of this harmful practice. Lucy was chosen to speak at her school’s graduation ceremony, where she shared the story of her friend, who was taken by strangers to undergo FGM/C on her way from the market. When Lucy’s father learned of it, the girl was rescued and taken to the nearest health clinic. “What pained me most was that my friend’s father was behind all these evil plans to have her circumcised and married off at that tender age,” Lucy said. Her confidence and measured words amazed the crowd and she was cheered on as she spoke. Lucy continues to advocate, along with her father, for the elimination of this practice in Kenya. The Alternative Rite of Passage training was so popular that boys asked for a parallel event. World Vision created a boys’ track that educates young men on the physical and psychological toll of FGM/C. It also teaches boys to use their unique position in marriage brokering customs to stop FGM/C by telling their parents and tribal leaders that they refuse to engage in child marriage or force a young woman to whom they are betrothed to undergo the cut. In northwest Kenya and around the world, poverty, abuse, and lack of opportunity keep far too many children from reaching their potential. You can do something about this. By encouraging your Members of Congress to prioritize foreign assistance, we can help lead the way to the end of FGM/C globally.